Working together to help you achieve more. At Emmi Roth, it’s more than just our artfully crafted cheese that will help you create your kitchen’s next masterpiece. It’s also our team of culinary professionals who are here to assist you with integrating cheese into your menu. With years of combined experience, our in-house chef, along with our trained sales staff, understand what it takes to run the line while managing the bottom line. They are truly masters in the fine art of cheese. So, whether you’re looking for new and innovative menu ideas, or you need a solution to a specific problem, we’re ready to be your partner in achieving success. Evan joined the Emmi Roth Culinary Team in the spring of 2011. Previously, he served as Chef of Cucina Italian Restaurant at the prestigious American Club Resort. 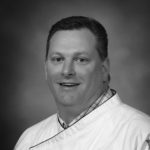 Most recently, he owned Wisconsin Culinary Specialties, which provided culinary support and training to various cheese producers and marketers. Evan works on our foodservice team to help customers imagine new ways to use Emmi Roth cheeses.